Want a good laugh? Want to laugh at the church? Want to be secretly suspicious that the author has been sitting in your church committee meetings taking notes? Then Writes of the Church: Gripes and grumbles of people in the pews is probably the book for you. From Amazon, Sarum Bookshop, The Bible Readers Fellowship and other good Christian bookshops. An excellent book for your churchgoing friends, relatives or vicar. By the creator of the Beaker Folk. It's weird times. The Chairman of the John Lewis Partnership comments that Brexit has hit the Partnership's profitability. And the Government's Secretary of State for Sticking Pens in Your Own Eyes steps up to tell us that eroded profit margins in a company that imports most of its wares has nothing to do with the pound dropping because the Government is determined to turn us into a low-grade, draughty, Singapore. The party that used to be for business has turned into the party that cares more about defending the delusions of the racists and idiots who lied to a nation. Having seen the Government's latest attempt to scare the European Union, through telling them how much a No-Deal Brexit would hurt the UK, we thought it was about time we dealt with the subject of Beaker Survivalism. After all, the original Beaker Folk managed to survive - often into their thirties - without insulin and a ban on roaming charges, so why shouldn't we today? "Good old boys (and girls)" will be studying how to do an appendectomy in the John Lewis Room. "Veggie Experts" please gather in the Rainbow Room for "How to tell a Mushroom from a Toadstool". I'm glad to say Hnaef is back from hospital now after his dry-run the other day. I think "dry-run" is actually his euphemism for the symptoms after eating that Death Cap. "Dominic Raab" level - please gather in the Daily Express Room for your guide on how to find your bottoms with two hands. The special course on running a whelk stall has been cancelled. David Davis was to have run this course, but he over-slept. I am debating with myself whether any of these categories do justice to the situation? But I suspect that much of the noise being generated from both #Leave or #Remain is directly connected to the campaign to make Britain Great Again, being voiced from the Daily Smell and The Daily Sexpress and the Sun. I can't figure out why we want to be great again? Surely we surrendered that when we gave up the Empire, starting in losing the Indian Sub Continent in 1947. Off course, we gained a Commonwealth, which we abandoned when we joined the European Project, and now we're abandoning that, for a regime of Isolation and reliance on an Ally led by all accounts, a idiotic, bumbling, crooked, businessperson, who is taking his country to hell in a hand basket. The delusion surrounding all of this is something called 'Popularism' which seems to be invading countries as disparate as Hungary, Poland, Denmark, Italy and here. Voting for the lowest common denominator is the things they all share. If we leave without a deal, will David Cameron be recalled to face treason charges? Will Margaret Thatcher be dug up to face trial for extreme conservatism? And what about poor Mrs May? Will she face the walk of shame from Parliament after losing a vote of No Confidence to hand over the Mantle of Power to Sir Vince Cable? in a new Tory/Libdem coalition - anything to keep out Corbyn. All possible consequences of the disarray in our current politics. Direct rule from Buckingham Palace might be needed, along with Martial Law for a period of time before we restore sanity and just stop the negotiations and accept our status as a minor vassal state of the European Obligarchs. Pedant alert. In the UK we do appendicectomies. What they do in the States is entirely up to them. We'll soon all be speaking Anglish (American English). we're talking about removing the appendix, not the append. Easter Fugue on Salzburg - An original Sacred Music video by FR. Hart. Click here. 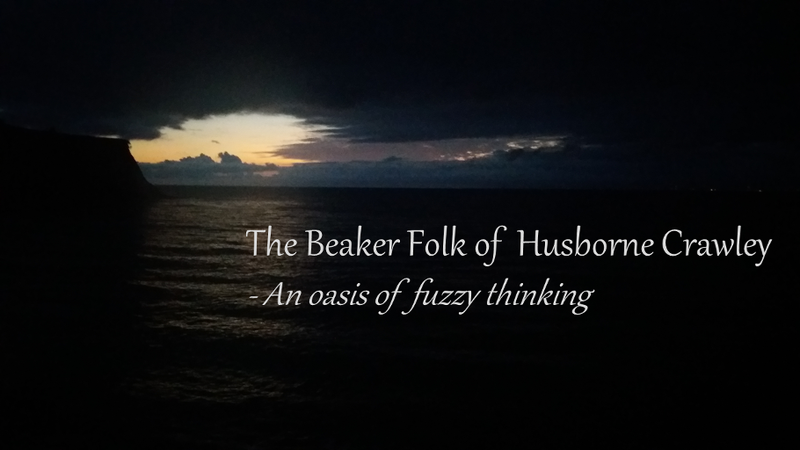 © The Beaker Folk of Husborne Crawley 2006 BC - 2017 AD. Powered by Blogger. None of the content of this site is remotely related to reality. Any resemblance to any real person, live or dead, would be some kind of miracle. No penguins were harmed in the making of this blog. Although a few guinea pigs were eaten. But hey you can't make guinea pig omelette without cracking a few eggs. The viewpoints expressed in this blog do not represent the official views of any religious group, and often don't even represent the views of the authors.